In the watch world, two months stand out. January is when SIHH takes place in Geneva and March is when Baselworld runs in Basel. At the helm of SIHH is the Richemont group. So, their watch brands, such as Cartier, Panerai, Vacheron Constantin, and so on, present their novelties for the year. Other non-Richemont powerhouse brands such Audemars Piguet and Richard Mille join too. And recently, a selection of smaller, independent watch brands like HYT and MB&F are also present. Baselworld, on the other hand, is where (almost) everyone else—Rolex, Patek Philippe, OMEGA, Breitling, and countless other companies—set their stage at LVMH’s Geneva Watch Fair 2017. Jean-Claude Biver, President of the LVMH Watch Division, decided to host his very own show for Zenith, Hublot, and TAG Heuer. While this may seem innocent enough, it did ruffle some feathers at Richemont, given that the LVMH Geneva Watch Fair had the exact same dates as SIHH, in pretty much the same location. The three LVMH watch brands presented their new watch collections on a boat moored on Lake Geneva and it was free for anyone to visit. Whether holding an event to take advantage of already present international watch media and luxury retailers is smart or crude on Biver’s part is a matter of perspective. So drama and egos aside, let’s take a look at some watches, shall we? Here are our top picks from Zenith, TAG Heuer, and Hublot to come out of the LVMH Geneva Watch Fair 2017. For 2017, Zenith brought back the coveted panda dial on two new El Primero models. 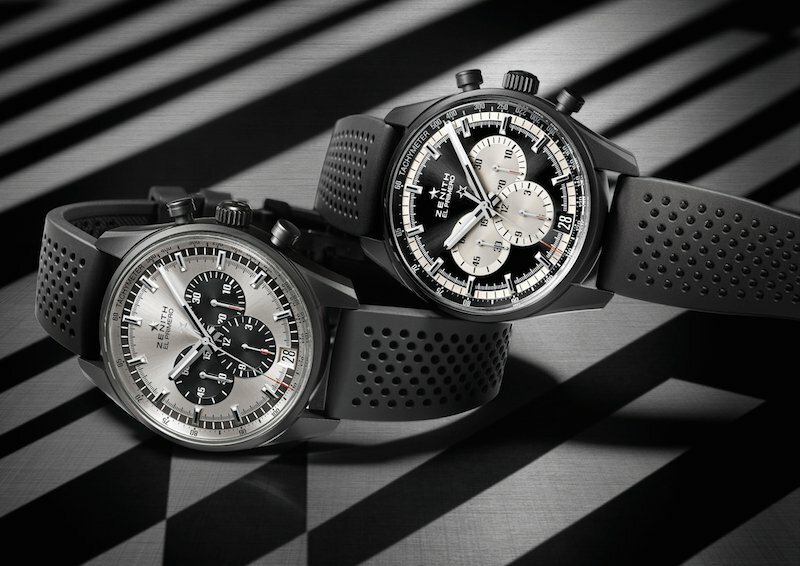 Sized at a sporty 42mm, the black cases of the new El Primero chronographs are made from aluminum coated with ceramic—referred to as “ceramicised” by the brand. The choice of material makes the watches very light to wear, yet scratch resistant thanks to the ceramic. The two versions include a black dial with white overlapping registers and a white dial with black overlapping registers. Furthermore, each watch comes with a perforated black rubber strap that’s reminiscent of rally straps. Of course what made the El Primero a legend in the watch world was its high-beat column-wheel chronograph movement. Even Rolex used modified versions of these movements in their Daytona chronographs. 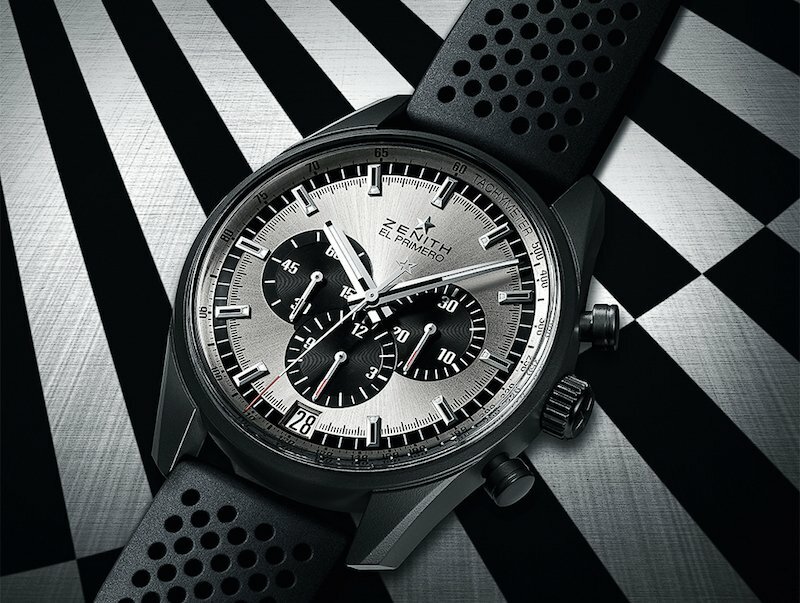 The latest versions are powered by the El Primero 400B Caliber beating at 36,000 vibrations per hour (v.p.h.) with 50 hours of power reserve. At $8,300, we imagine the new Zenith El Primero 36,000 VPH will be one the year’s most popular chronographs. 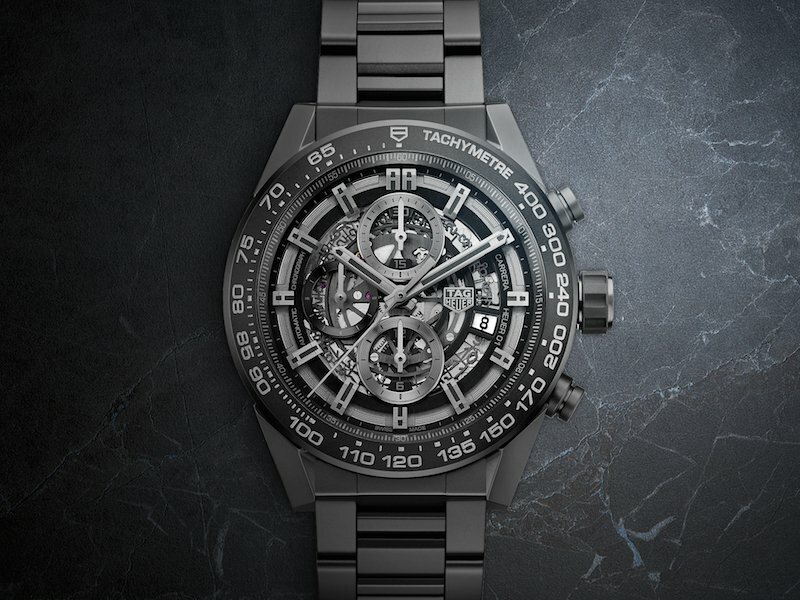 The current flagship chronograph from TAG Heuer, the Carrera HEUER-01 made its debut two years ago. Although it houses a manufacture movement, dubbed the HEUER-01, the Carrera HEUER-01 collection still manages to offer a more accessible price point. This year, the latest model of the Carrera HEUER-01 sports an almost entirely ceramic exterior. From the 45mm case to the H-links bracelet to the tachymeter engraved bezel, it’s all about the black matte ceramic. The black ceramic material is not only appealing in style but it is also extremely practical. It does not scratch, oxidize, or fade and it’s lighter than steel. The ceramic skeletonized dial allows a view of the manufacture movement working within—a self-winding chronograph caliber with a 50-hour power reserve. The $6,300 price of the new TAG Heuer Carrera HEUER-01 is very competitive considering its full ceramic exterior and in-house movement. 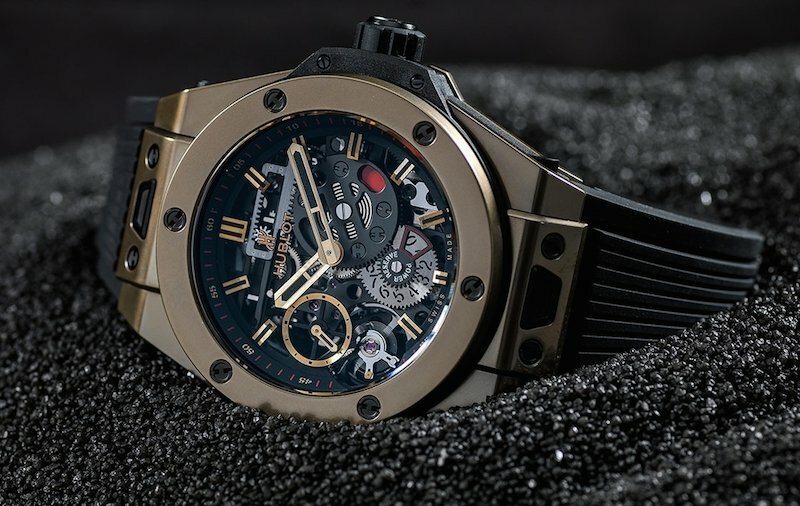 The Hublot Big Bang MECA-10 Magic Gold takes the in-house Hublot Manufacture caliber–the HUB1201–and encases it within a “magic gold” 45mm case. Magic Gold is what Hublot calls their patented gold alloy that includes ceramic. The addition of ceramic means that the gold is now scratch resistant–a welcome innovation indeed. As with the first two MECA-10 models, Hublot gives us a full view of the manual-wound HUB1201 inside the Magic Gold version too. Inspired by the children’s construction set, Meccano, the in-house movement is actually very alluring to look at. Furthermore, with 10-days of power reserve, it’s a beast. The Hublot Big Bang MECA-10 Magic Gold will be limited to only 200 pieces and is priced around $35,000.